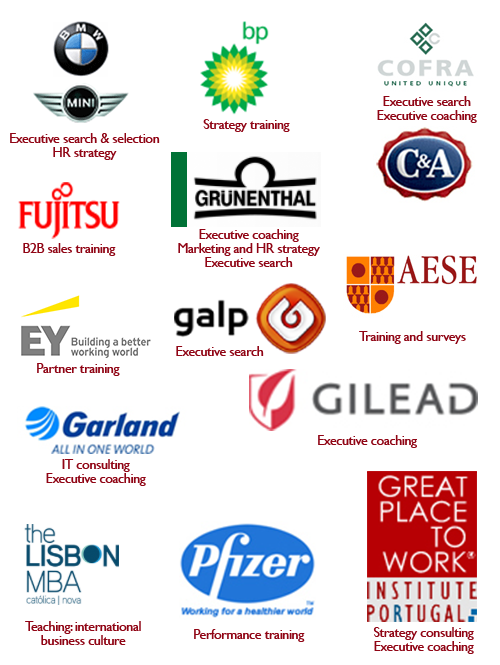 Over the last two decades I have been lucky to work with a wide range of global companies in executive search, consulting, teaching, training and coaching. "I would like to thank you for your services over the last two years. You have provided excellent coaching to our senior management team, objective advice and an outstanding recruitment service. I know I can trust you to be discreet, thorough and creative in your approach. I also appreciate your enthusiasm to adapt to our needs and culture and to take special care of our managers and candidates." "Clive Bennett coached me for a period of six months when I was Sales & Marketing Director in Portugal. He helped me transform my leadership style and take a much more objective and open approach to my role and my working relationships. Clive then became my mentor and his advice and thoughtful, external view was extremely useful to me in evaluating business and career decisions. I am very grateful to him and continue to rely on his coaching and consulting support in my current HQ role." "As strategic HR partner to BMW Group Portugal when at Ad Capita Executive Search, your advice and support to our Board on key HR matters such as succession planning and change management has proved invaluable."